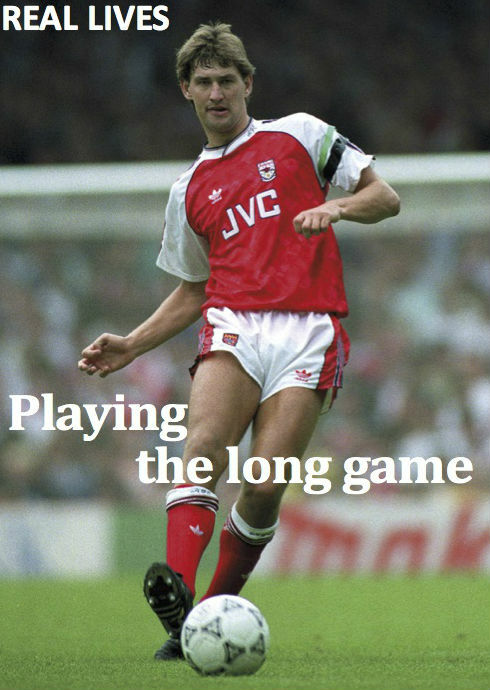 Tony Adams’ glittering football career could not mask deep-seated problems that needed to be tackled. He shared his story at the NHSSMPA conference. ‘You don’t suddenly become an addict – there’s a path, a journey,’ Tony Adams told the NHSSMPA conference. Adams’ 19-year football career had included 669 matches for Arsenal and 66 for England since his debut in 1983, but over much of that time he had become increasingly addicted to alcohol. ‘I was very shy as a kid, full of fear. I had the worst attendance at the school – I just couldn’t do it. The book would be going round the class and I’d be having a panic attack. When I got the book I was such a mess, I couldn’t say the words. ‘My family would say “how was school today?” and I would just shove it in a box, bury it as deep as I could. Football was my escape, psychologically, emotionally. I was as free as a bird out there, kicking the ball. I did that instead of facing the fear and going to school. I couldn’t do real life, I couldn’t do interaction, I couldn’t do school. I couldn’t do thoughts and feelings. So I’d pick up the ball. On the football pitch I was comfortable in my own skin. ‘When I was 17 I broke the metatarsal in my foot and I couldn’t go to football to escape those thoughts and feelings. But I found that alcohol did exactly the same thing for me. It took me away from all that stuff – everything. ‘When I first picked up alcohol, I didn’t like the taste. So I had to work on it because I loved that feeling of numbness, that escape. I’d wet the bed and it became normal – I’d just roll to the other side. It got to the stage where I’d do that and then sleep on the floor – no personal hygiene, no dignity, no self-respect. ‘My football career and my using career went side by side. Every time I didn’t have football, I needed something else to numb all those thoughts and feelings in life. ‘I was trapped in denial. If you’d have told me I had a problem with alcohol I’d have told you to get lost. The consequences then started to happen and the pain became unbearable. ‘So the wife’s gone. Then I got injured and couldn’t play. As long I was on the pitch I was getting rid of all that anger – and getting paid for it! ‘It was starting to dawn on me. My mother-in-law gave me the name of a therapist. It was the first time in my 12 years of drinking that I didn’t want to drink again – yet I was still getting drunk. I had crossed the line and I couldn’t get back. I had completely lost all control over it and it frightened the hell out of me. ‘I tried to do it with willpower – “I’m not going to drink again.” But with no tools and no idea how to stay stopped, I continued to use. There was the big tournament in ’96, the European Championships, and I white-knuckled it – football had always worked for me. I locked myself in my room on the 15th floor of the hotel, with my life falling to bits. I said to the lads, “when we win it I’ll go and have a drink with you, we’ll celebrate,” but until then I was scared – I didn’t know how to drink. As soon as the last game of that competition was kicked and Gareth missed that penalty, I went back into the bar in the corner of the dressing rooms and I was off. ‘I had my moment of clarity, my surrender moment at 29 years of age. I started to cry. “I don’t want to drink, I’m still getting drunk. All this behaviour I’m doing, I don’t want to do.” My life was a complete and utter mess. ‘But as soon as I surrendered, as soon as I gave in, it was a release. Somewhere inside of me I had a moment of clarity, something shifted within me that let a shaft of light in and the therapy got me well. ‘The best thing about recovery is that you get your thoughts and feelings back – and the worst thing about recovery is that you get your thoughts and feelings back! ‘My life is fantastic today. I get angry, but I express that anger appropriately. I’ve had to learn absolutely everything from people who are down the journey a little bit further. ‘I’ve had many “surrenders” and emotional “bottoms” – things that took me to a very dark place. But I got through it with different tools, including talking about it. We don’t know what the triggers are for other people – all we can do is to lay out the tools in front of them, whether it’s a treatment centre, a counsellor, a friend, or a coffee with someone. Tony Adam’s book Sober was published in August by Simon & Schuster, ISBN 9781471156755. He has used the proceeds of his books to set up Sporting Chance Clinic to support current and former professional sportspeople.